What can I do to strengthen and improve the teaching profession? Honestly, not much. It isn’t that I lack passion for the work of teaching, or that I don’t have ideas about improving the profession. It’s just I recognize the limitations of my – or any individual’s – ability to affect broad, systemic change. By myself, it’s merely waxing philosophic to talk about improving the teaching profession. But as part of a collective, then the opportunity for improvement and transformation becomes real. For teachers, our working conditions are our students’ learning conditions. Thus, it’s vitally important that any work teachers undertake to improve the profession includes students and their families as well. Integrating these many voices into a single collective is doubtlessly a Herculean challenge, but a model for how to do it already exists: the community schools model. This model is more than a hundred years old, and has present day success stories in cities such as Cincinnati, Ohio, Baltimore, Maryland, and Austin, Texas. One of the reasons these cities’ community schools have had transformational success is that the process to become a community school began with doing needs and assets assessments of all stakeholders. In other words, every member of the school community had the opportunity to identify what things were working within their school, and what things were challenges. Then the stakeholders had the opportunity to talk about what they could all do to address the challenges in a meaningful way. 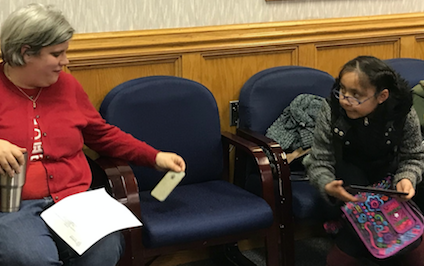 Above, Goff waits at the back of the room with students while staff and parents give testimony to the Board of Education about piloting the Community School model in Durham Public Schools. I believe in this community schools model of transformation because it acknowledges the interconnectedness among teachers, students, parents and school administrators. Improving the teaching profession can’t happen in a bubble; efforts to improve teaching necessitates improvement of student outcomes and family engagement. And, since Club Blvd. is currently undertaking work to become Durham’s first community school, I will share my thoughts about how we can succeed in improving both the teaching and learning that happens there. These are the thoughts that I will include on my own needs and assets survey. 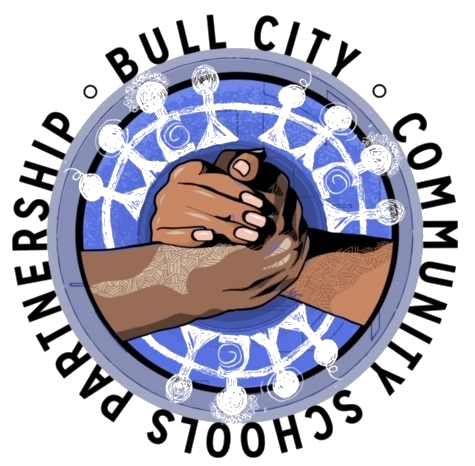 First, in a diverse community like Durham, and a diverse school like Club, racial equity work is essential. We can’t talk about improving teaching and improving our schools unless teachers are knowledgeable about racism and how systemic racism impacts the experiences and opportunities of people of color. Schools have tried for a long time to operate as race-neutral entities, and though that approach may feel comfortable and familiar, it isn’t effective. Second, to improve teaching and learning, teachers must have on-going access to meaningful professional development. Because of budgetary constraints, the amount and quality of PD is fractional compared to when I first began teaching 17 years ago. And yet, even though the money for PD is gone, the need for it remains. So, in order to continue growing as professionals, teachers must advocate for – and if necessary, create their own – high-quality professional development. Though that may sound daunting, once again a model for this already exists. During an Out Of The Box session this school year, the Durham Association of Educators shared PD on building strong relationships with families, students and colleagues. This workshop had no paid presenters and no glossy handouts, but it did facilitate lots of dynamic conversations and sharing of experiences. When I left that workshop, my head was swirling with ideas. Better still, when I left I had lots of people with whom to talk through those ideas – my colleagues who attended and facilitated the workshop. Finally, to improve teaching we have to make sure that teachers are accountable not just to EVAAS standards, but to the real-life students and families they serve. Precisely how that type of accountability will look? Well, that’s up to students and families. And that’s something I look forward to talking about when Club becomes a community school. Next: Next post: Welcome to the Community School Coordinators!